Ken Frey moves all-in for just over one million chip with the blinds at 60,000-120,000 from the small blind. The board runs out [4d][4h][2c][Ac][2h] and Harris takes the pot with his jacks. Ken Frey is eliminated in 4th place, taking home $10,997. 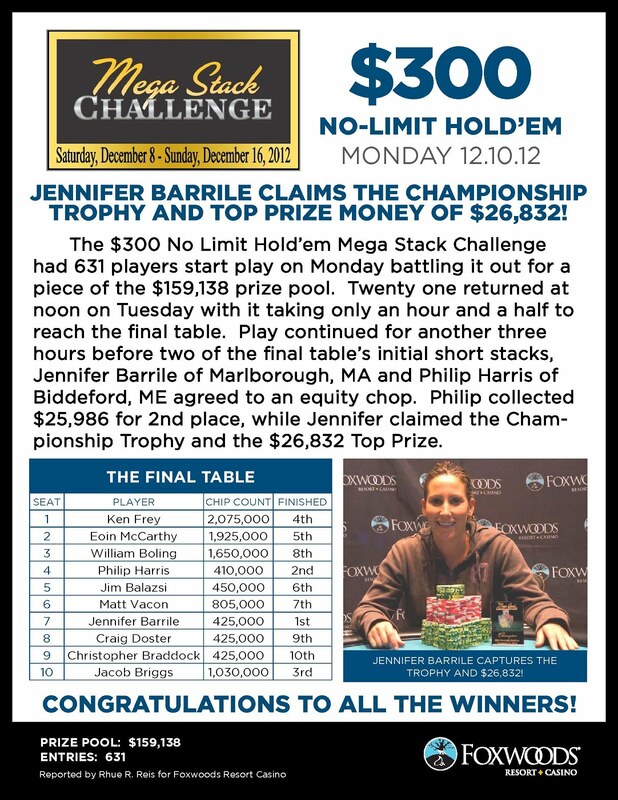 Eoin McCarthy raises to 500,000 before the flop and Jennifer Barrile moves all-in from the button, having McCarthy covered. McCarthy thinks for a few moments before announcing a call. 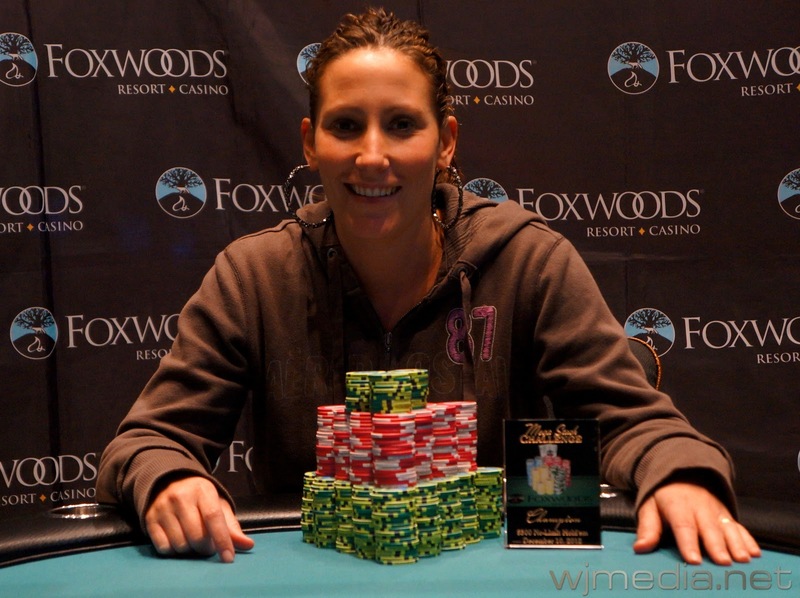 The board runs out [Kc][Kd][4h][4s][3s] and Barile's pocket eights hold up to win the pot. Eoin McCarthy is eliminated in 5th place for $8,291. After a flop of [Qs][5c][3s], both Jim Balazsi and Jacon Briggs check. The [3c] falls on the turn and Briggs leads out for 400,000. Balazsi announces that he is all-in and Briggs immediately makes the call. Briggs turns a full house and has Balazsi already drawing dead. The river is the [4c] and Briggs wins a monster pot and now holds nearly half the chips in play. Jim Balazsi is eliminated in 6th place for $6,333. 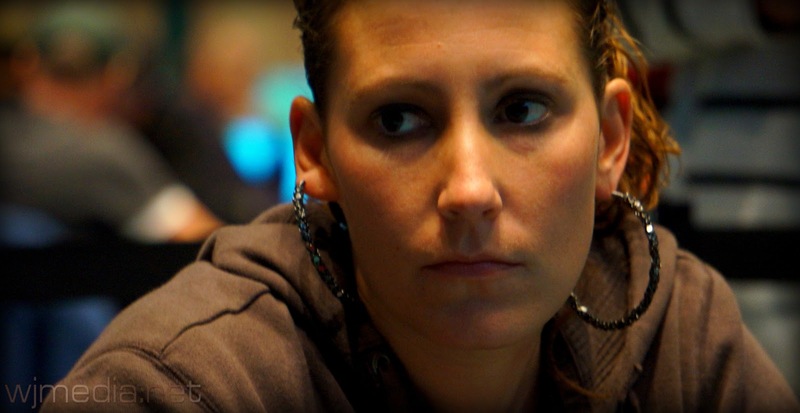 In a blind versus blind situation, Jennifer Barrile gets all-in against Matt Vacon. The board comes [Td][9s][5s][2c][8h] and Barrile doubles up with her pocket jacks. Vacon is left with only 10,000 in chips. The next hand, his is all-in for his ante and loses to Barrile, who holds pocket jacks for the second straight hand. Matt Vacon is eliminated in 7th place for $4,902. After being crippled just a few hands prior, William Bolins moves all-in for his last 130,000. Jim Balazsi makes the call and then Jacob Briggs announces that he is all-in as well. The board runs out [9c][8d][3c][Qh][2c] and Briggs takes the pot. William Bolins is eliminated in 8th place for $3,851. After a raise pre-flop by Jim Balazsi, Craig Doster moves all-in and Balazsi makes the call. Doster is in great shape to double up until the board comes [Jc][Jh][2c][6d][3c]. Balazsi flops trip jacks to win the pot, eliminating Doster in 9th place for $3,086. The board runs out [Ad][Ah][8h][7d][2c] and the pocket fours of Balazsi hold up to win the pot. 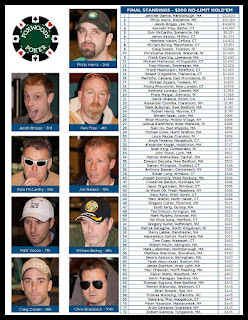 Braddock is eliminated in 10th place for $2,450. 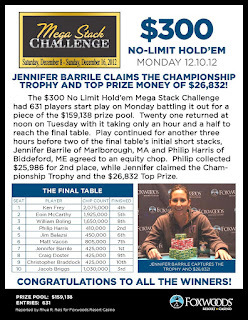 We have reached the final table in the $300 No-Limit Hold 'em Mega Stack Challenge event. The blinds are currently 25,000-50,000 with a 5,000 ante. Day 2 of the $300 No-Limit Mega Stack Streaming Live! The $400 No-Limit Hold 'em Six-Max event is now underway. The final day of the $300 No-Limit kicks off at noon today. Play has come to an end on Day 1 of the $300 No-Limit Hold 'em Mega Stack Challenge event. 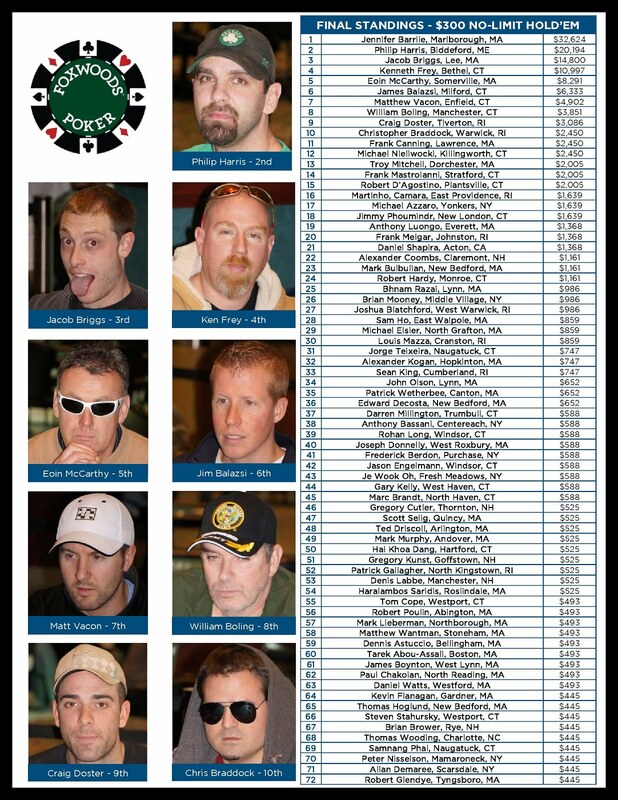 There are 21 players remaining and the average chip stack is now 451,000. Play will resume at noon tomorrow and play down to a champion. 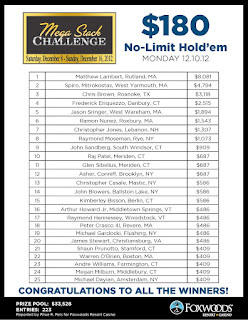 Final end of day chip counts and Day 2 seat assignments will be posted momentarily.